Gaveia d.o.o. is one of the largest online travel agencies in Croatia. It was founded in 2015 and its headquarters are in Novigrad, in Istria. 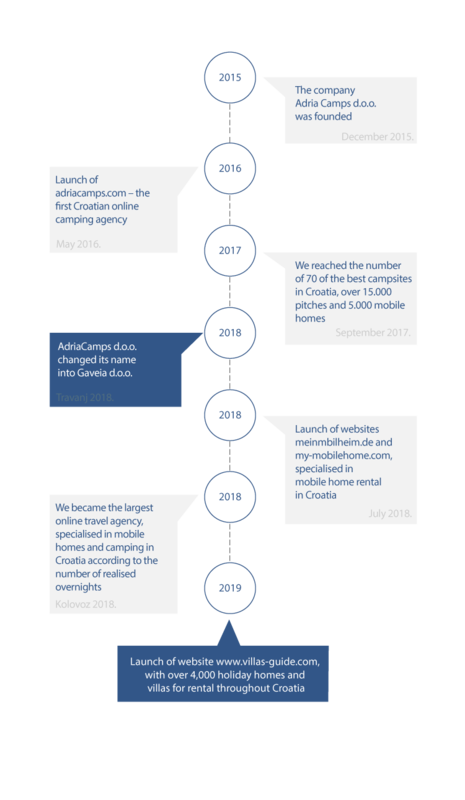 Within our portfolio, we are developing 3 online booking platforms for 3 tourism niches in Croatia – Camping, mobile homes and Villas and holiday homes. We bring together a team of 10 people with many years of experience and knowledge between them in the local and regional tourism markets. Fully focused on the guests’ needs, through our own call centre, we offer the possibility of booking of desired accommodations –mobile homes, campsites, villas or holiday homes in Croatia, supplemented by all the required information and a continuous support service. Regardless of whether it concerns a holiday home for a fortnight, a mobile home for a night or a campsite, our experts will be happy to assist you in choosing your next holiday destination – and all tailor- made according to your interests. Rich local know-how and knowledge, familiarity with the tourism market in Croatia in combination with many years of experience in different tourism niches and professional manner in communication in foreign languages are the guarantee of a full and rounded support for your stay in Croatia. From finding desired accommodation and staying in a booked facility, to your return, our team is fully dedicated to you and takes care of your holiday. The activity of tourist agency is subject to official supervision by the Ministry of Tourism, Tourism Inspection POREČ, Mate Vlašića 20.